Pluto is billions of miles away, and it took NASA’s New Horizons spacecraft nine years to get close. None of us will ever stand on the dwarf planet’s distance surface, but now, there’s a new NASA tool that’s bringing a little bit of Pluto back to the Blue Marble. Artist’s concept of Pluto’s frosty surface. 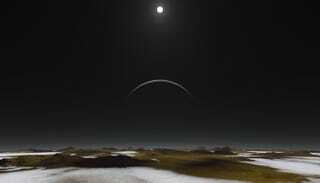 Even at Pluto’s distance from the Sun, it isn’t completely dark all the time. In fact, for a brief a moment near dawn and dusk, the illumination here on Earth matches that of noontime on Pluto. NASA calls this special moment Pluto Time, and now, you can find out exactly when your region’s next Pluto Time is taking place. NASA is encouraging all of us to go outside at our local Pluto Time, take a picture (no flash!) and share it on social media (#PlutoTime). The space agency will combine some of the best Pluto Time shots from around the world into a mosaic image of Pluto and its moons. On July 14th, 2015, New Horizons will slingshot around Pluto, giving us our best look yet at the dwarf planet’s surface. The data New Horizons sends back will offer planetary scientists insights into Pluto’s composition and geologic activity. Some even hope it’ll convince the powers that be that Pluto deserves a second chance at planethood. One way or another, it seems, Pluto Time is coming.